We first confess that we do not know how to pray for a tragedy such as this. With each statement we oscillate between glibness or melodrama. Our neighbors in Haiti have suffered calamity. Attend to them. Be gracious unto them. Not in some disembodied way (at least not exclusively) but through us may your grace abound toward them. Keep people alive. And though it is absolutely unfair to ask of anyone in such a desperate state, please grant them patience. Break our hearts, even as yours breaks as you witness the 100,000 or more dead, the 3.5 million or more injured and/or homeless as well as the 2 million children impacted by the earthquake. Break our hearts with the images of unfathomable devastation and massive displacement of people that for now assault our airways around the clock. Break our hearts with acute awareness of what it means to hear that all triage facilities, morgues and cemeteries are already full. Break our hearts with the rows of the unburied dead and the stench of bodies decomposing in night time temperatures that top 80 degrees. Break our hearts with the specter of disease and unrest. Break our hearts that we may learn to grieve with you for your beloved world. May Haiti now prick our consciences with questions of our duties of interpersonal love and international justice: Where do you bury over 100,000 dead? How do you do so in time to avoid the spread of disease? How do you absorb all the rubble in an environmentally responsible way―in a way that doesn’t make an already poisoned habitat even more inhospitable for its inhabitants? How do we quiet our culturally colonial predilections in order to cooperate with respect with an already existent leadership in Haiti and not to overrun or usurp them? How do we remediate the West’s historically predatory relationship with Haiti which helped divest Haiti of its natural resources, so that the Haitian populous (not just elites or foreigners) can thrive and find their place in a now global society? How do we create conditions in which the Haitian diaspora can return, maintaining their desire to thrive, and help rebuild their native land if they so desire? Who will provide homes to the 100,000 previously orphaned Haitian children whose ranks have likely more than tripled? Who will open their doors to refugees, transcending the inanely demonic stereotypes of Haitians as a hereditarily dirty, shady, lazy, violent or otherwise despicable people? With these questions and more, prick our consciences that the Haitian struggle for survival becomes our own struggle for an embodied virtue. Afflict us with empathetic anxiety for those now almost a week neglected, whose mouths grow parched for want of clean water, whose bellies cramp for want of nourishment. May we share in the anxiety of those who see planes landing afar off, but are left to wonder when or even if aid will make it to them. May we chafe at the mobs of roving bad actors terrorizing those in agony. May we grieve with those who now suffer the indignity of watching their dead scooped up by bulldozers. May we appreciate the frustration of those who have begun to erect monuments of corpse and boulder as a testament against being forgotten. Afflict us with empathy for any who lack the same basic human dignities to which we’ve grown accustom. Yet do not leave us paralyzed or estranged in our collective sorrow as we all too often are; from the ashes of our sympathies may our moral imaginations rise with fresh convictions of how to embody your hopes, dreams and desires as best we understand them. Whether it be the ability to text “Haiti” to 90999 to donate a meager $10 that has raised over $10m for the Red Cross’s efforts, or the use of Facebook as a database for photos of and communication between missing persons and their families, or Alyssa Milano’s use of Twitter to challenge CEOs to match her $50k pledge to relief, or more simply, my own students at Pine Forge Academy’s efforts to incarnate their faith by sending money for water to what is for about 15% of them the land of their heritage. Make our imaginations for service as fertile as the need. May we hear your call to stand in the gap for Haitians (and those in need anywhere) as long as is necessary. All that is happening even now is just the beginning of what will be needed to redress the historic humanitarian crises that were exponentially accentuated by the trauma of a category 7.0 earthquake. As Americans, we have cultivated such short attention spans. Please stretch our attentiveness to meet the needs of our neighbors. 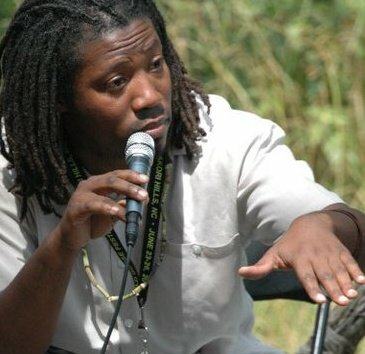 Augment the efforts of NGOs and charities organizing and working to alleviate Haitian suffering, particularly organizations like Partners in Health, Oxfam, Grassroots Int’l, Action Aid and Doctors Without Borders that facilitate indigenous solutions and labor to build the internal capacity of a country. In addition, enable short-term and long-term crisis relief orgs, such as World Vision, Save the Children and CARE. Sustain large and small faith initiatives, such as the Salvation Army and Catholic Relief Services. Even abet those who have adapted their missions to meet present need, such as UN Peacekeepers and US military. Help their efforts to be coordinated and effective. Furthermore, Gracious One, even as we lament we must also repent and openly surrender to your regenerative spirit the meaner meditations of our hearts. In the mist of this mind-blowing catastrophe, there are those who have said awful things. One suggested that Haiti has in essence brought affliction upon itself; in doing so he also, perhaps inadvertently, implied that God’s will may have been better served through Haitians’ continued enslavement. Another characterized Pres. Obama’s quick and unequivocal response to the Haitian crisis as a racially motivated political stunt and has since encouraged Americans not to support the President’s attempts to raise money on behalf of Haitian relief. Yet another has advocated the continued deportation back to the chaos in Haiti those who previously counted the conditions of their lives there so awful as to merit the risk of survival in open shark-infested seas for a chance at merely undocumented subsistence in the US. I must confess that I have wanted to excoriate those who speak this way, but at some point, as followers in the way of Jesus, must we not question the fruitfulness of responding to such drivel? Besides, more tragic and worrisome than that there are those who would deal in such bunk is that there is a market for it. I do not recall Jesus responding to every foolish or even destructive imagination of those around him. Thus, as a most imperfect vessel seeking to bear your most perfect grace I now pray, Father, forgive them, and teach us to forgive. Nevertheless, may these men fade into obscurity, because their audiences become enchanted by a more beautiful song. Still, in all his irreverent twaddle, Pat Robertson was right about one thing. Haiti is a land that has suffered under the scourge of what might as well be called “curse.” Typical of the colonially minded, Robertson just didn’t spread the blame far enough around, and we would be remiss should we end our prayer without asking forgiveness for the part we’ve individually and corporately played as unwitting (and in a few cases witting) exploiters of Haiti. As Tracy Kidder reminds us, “while earthquakes are acts of nature, extreme vulnerability to earthquakes is manmade.” Haiti does not just happen to be the poorest nation in the western hemisphere. Heretofore, it has been Haiti’s encounters with a physically and culturally, then economically, then politically colonizing Western world that has systematically divested it of the wherewithal to thrive, and we in willful ignorance never knew that it has more often than not been America’s insatiable resource consumption, clandestine corporate agendas and dastardly national interests that have driven repeated assaults on Haiti’s national health. We condemn the lies we’ve told ourselves for so long. Haiti hasn’t only had perpetual bad luck and awful leadership; we―the West―have been Haiti’s curse! We took Haiti’s gold; we demanded the over-cultivation of it’s signature crops (i.e. sugar, coffee and indigo) to the point of soil depletion; we‘ve held it hostage to predatory trading and lending practices; we clear-cut its forests ensuring pervasive soil erosion that poisoned the water supply and made the land generally infertile for adequate crop production; and when Haiti had few natural resources left to speak of, we devalued its currency in the world markets, making it near impossible for Haiti to buy enough of the basic resources it so desperately needs; in the meantime, we sustained the strongmen who cyclically exploited the common people in order to maintain the gross inequities entrenched under Spanish, French, British and American occupations; we trained the strongmen, we sold them the guns, and we became the all too eager depositories of all they stole from their nation. Sure there has been plenty indigenous corruption, but we too have been more than culpable in rendering Haiti too weak to fend for itself. But now, we repent. At least as individuals, we turn away from our previously assumed benevolence, and we commit ourselves to actual goodwill and generosity of spirit―yes, even altruism. From now on, we will seek to understand the true nature of our nation’s interaction with other nations and support equitably beneficial treaties and alliances. Recognizing our part in Haiti’s persistent poverty, some of us even commit to lobbying for full forgiveness of all of Haiti’s international debts, including any portion of the $100 million of aid recently pledged by our President that is expected to be paid back. By your grace, we will police and prevent (if at all possible) Haiti’s insidious transition from victimhood at the hands of despotic greed to victimhood on the altar of corporate greed that all too often results as global corporations attempt to cultivate new markets. We will also demand that our leaders not try to remake Haiti “in our image and after our likeness”―what are mere sociopolitical challenges for us, might for them pose crises―but will respect Haitians right to self-determination, even at the risk of disagreeing with us. All this and other or more, we commit to because we are vaguely beginning to grasp the awesome charge and glorious privilege of being called by your name to be participants in your hopes, dreams and desires for the good of your beloved world. Our attempts at love and justice will be feeble at best. Please compensate for our shortcomings. Thank you for entrusting us.